El Universal finally published some results on the PISA programme in Miranda. That Northern-Central state of Miranda is the only region in Venezuela that is taking part in a scheme for open evaluation of quality in education. The central government, led by the military Chávez and his Boligarcs, is opposed to such programme because they argue "Cubans are our counsellors", so that's enough. Never mind that Cuba's often praised educational system has long stopped being compared to others. Kudos to Miranda, specially to Juan Maragall and Henrique Capriles. They decided to introduce some transparency to their administration and see how pupils in their region really compare to the rest of the world. That is something Chavismo would not dare to do. Results in Miranda showed how bad pupils score compared to others. Even though the ones tested in Miranda did better than Brazilian or Argentinian pupils as a whole, they did worse than Chileans or Costa Ricans, not to mentioned those of OECD countries. And mind: those pupils are not completely representative of Venezuela as private schools were over-represented in the sample. Last but not least, and this is something the article doesn't say, academic levels in places such as the Llanos in Central Venezuela tend to be way lower than what we see in Miranda. That has been the case since time immemorial. That's how most military now in power have a strong Llanos background. Here you see a chart I produced some months ago based on a German book from 1920 by a certain Otto Bürger. That book is a magnificent snapshot of Venezuela during Gómez's time. I decided to show how many inhabitants each state had per pupil. 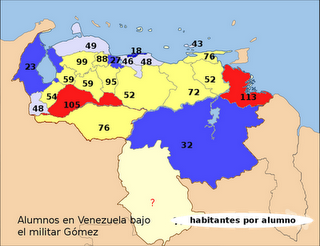 Barinas (West in red) had one pupil for every 105 inhabitants. Delta Amacuro had 113. Amazonas, in the very South, didn't even make it for the statistics back then (it was not a state and its population was very small - mostly native Americans in the jungle back then- but still they could have mentioned it). Miranda had 48 inhabitants for each pupil you would find. I am absolutely sure relative differences still persist. That's part of Venezuela's reality and that is why we can't still talk about a Venezuela but about several Venezuelan regions. A large part of schools in Miranda are actually controlled by the central government, so the regional government of Miranda could not include them for this test: the national government would never accept that. Instead, it took some public schools it does control and a lot of private schools that could join in willingly. And of course: there is a huge difference between public and private schools in Venezuela. I went to public schools for most of the time and only took two years of private schooling at the end. I could see quite some difference. My brothers and sisters went all the way through public -free- schools but they are older. My parents went to public - free - schools. Since the seventies standards kept going down the drain and most people who could afford it started to send their children to private schools. The tendency has worsened...which is quite telling about what a farce this so-called "socialist" revolution has become. Of course, Boligarcs will only say that now, under "Bolivarian socialism", more people can afford private schools. My foot. Public school standards have kept going down the drain for decades, but more so since Chávez came to power. Private institutions are not very good either and their standards also kept going down but not as dramatically. And that is one of the reasons why the Chávez government does not want to let Venezuela take part in the PISA programme. I hope Miranda can include more public schools in the next PISA round. Actually, I really hope Capriles wins the elections and can thus let the whole of Venezuela take part in the PISA programme.